On this last day of the year I'm going through photos taken this year and choosing some without regard to theme, though a majority of my favorites are still those taken in Spain that have yet to appear here. Click any photo, especially the third one, to see in higher resolution. 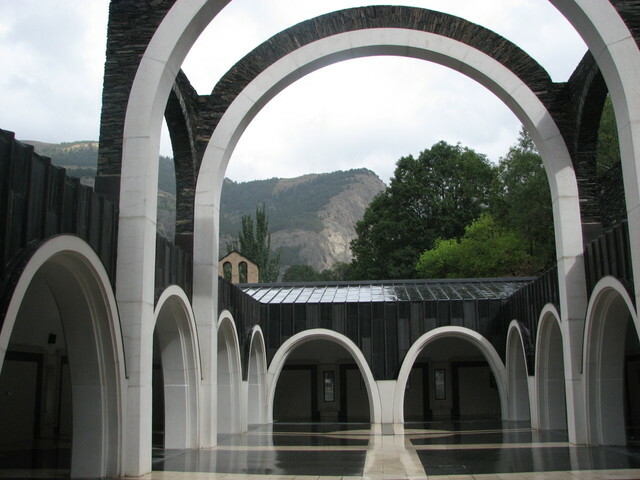 My favorite Sanctuary both the restored (after a fire) original and the modern arch-filled Sanctuaria de Meritxell (pronounced Merry Chell) in Andorra, a small country between Spain and France. The Original Sanctuaria de Meritxell after restoration. 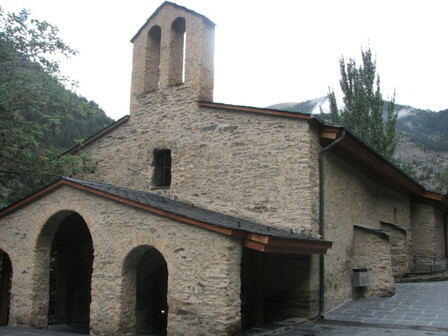 These two buildings, splendidly set in the heart of the Pryanees, perfectly represent the past and present of religious art in Andorra. 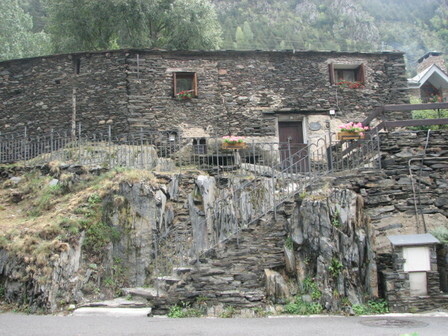 And while in Andorra, another favorite--my favorite cottage--is also located on the grounds of the two Sanctuaries and is now used as a gift and memento shop. 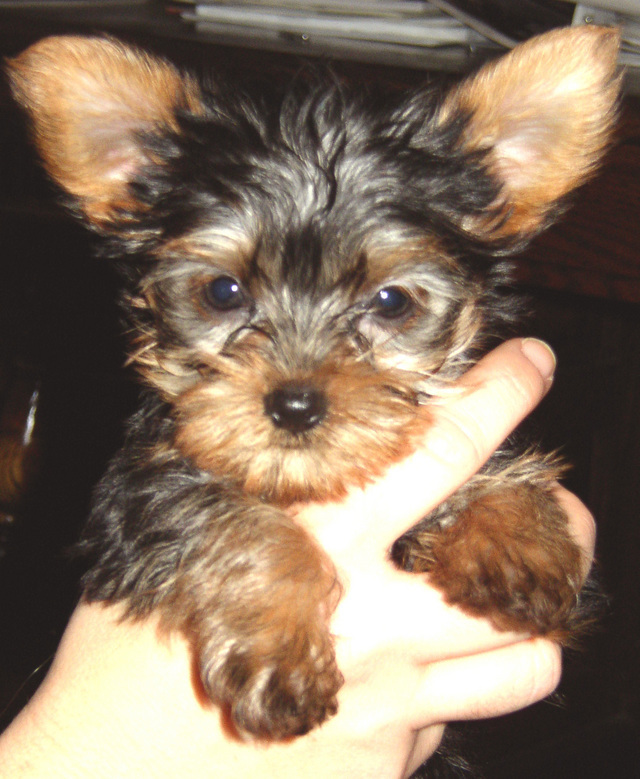 Lia, my son and daughter-in-law's new "Yorky" puppy. I've always leaned more toward medium to large dogs--athletic fetch and frolic dogs. We've had two English Springers--and a couple of stray dogs without collars who found us and no owners answered the ads and posters we posted in the neighborhood. We've loved them all. I've never even considered a "toy" dog, although after spending some time with this sweet little, totally portable, puppy, I think I could be convinced. She does at times, however, seem more like a cat than a dog. At nine weeks she tipped the scale at 1.25 pounds and is projected to reach an adult weight of 5 to 7 pounds. I will gladly puppy-sit the little one but I think I would like a dog at least twice her size as a minimum. This past week we've been slowly putting up lights and placing favorite Christmas decorations around our home. I was slow to get in the holiday mood but when the boxes were opened and I found some favorite old friends with memories attached I succumbed. This piece should have made it to the trash bin long ago but each year I mend it to keep the puff balls on or the straw hanging together. 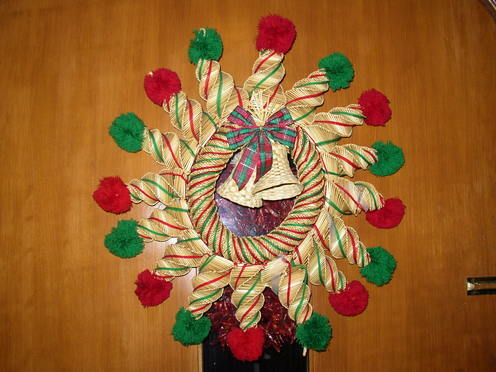 I bought it in a Mexican market and just enjoy the frivolity it adds to the door. Now I'm ready to tackle the wrapping and sending. I am not a believer in serendipity. I do not receive messages from the universe, angels or extraterrestrials. I do, however, believe in grand collisions of coincidence. I love corvids and collect their likenesses in whatever form I can find. On our 12-hour road trip two weeks ago, still on jet-lag from the 12-hour return trip from Santiago to Denver, I was not contemplating crows, ravens or magpies. On I-25 South from Denver to New Mexico there are several 100-mile stretches of highway between small towns and only three or four roadside rest stops in 600 miles. Usually we never pass a rest stop. This time we did. When Nature's call became quite urgent I requested the next available stop so B turned off onto a side road which led to a small convenience store. On the roadside we saw pickups and trucks from which their owners sold firewood, jerky, chili ristras and other goods but at that moment I was not interested in shopping. On the way back I scanned the sellers for a photo opportunity and suddenly I yelled, "Stop." Sitting on wooden stumps in front of a large white panel truck were wire sculptures of eagles, hawks, roadrunners, squirrels--and one crow. The crow just happened to be the only one I could afford--so I bought it. I talked for a long time with the artist. He was moving across country, working, camping and selling as he went. He gave me his card. Take a look at his other works here. I'm fond of saying, "I don't need any more things in my life," but every once in a while an irresistible coincidence appears and another favorite joins the collection. I can't remember when I first decided that crows, ravens, jays and magpies were my kind of birds. It may have begun when the Baca County Extension agent would stop by our ranch for coffee and show us a wounded crow or magpie that he had found. He soon learned that I would volunteer to feed and water them until their wing or leg was healed. He would retrieve them on his next trip and release them into the wild again. Their shrill raspy caw and their in-your-face attitude expressed everything I thought I could never be. I was shy and withdrawn as a child and wanted very much to be brave and outspoken like the corvid patients in my care. I have snapped hundreds of photos of these birds only to have them move or fly to ruin my shot. So I have resorted to the next best thing: I collect books, art and crafts which celebrate my corvid heroes. My friends often give me corvid gifts. 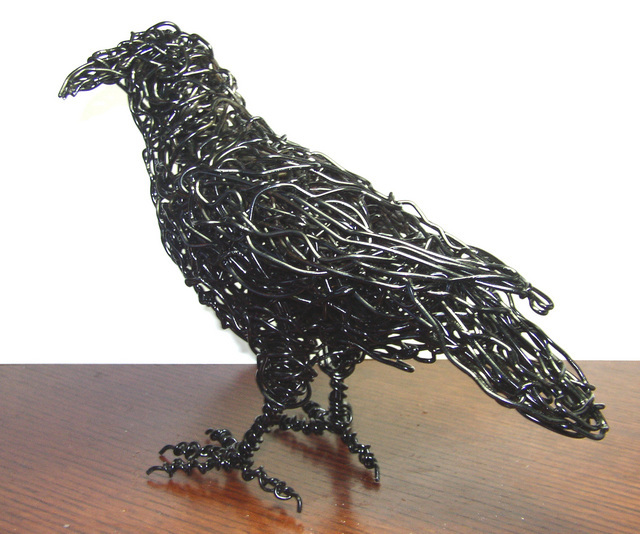 My husband gave me a sculptured metal crow for Christmas one year. My favorite book about the corvids is Bird Brains, an appropriate title as they are considered to be exceptionally intelligent birds--and the book contains wonderful photos as well as fascinating information. I wrote a poem about this window in 1999 when I had neither a scanner nor digital camera. Now I can include a proper visual image to accompany the poem. to whom it wasn't ordinary. of gold, green, brown and rose. in a house built in 1940. Strolling through Porvoo, the second oldest town in Finland, I found a beautiful garden with a studio/gallery at the end of a flower-edged path. I followed the path and entered the studio, testing for English with a tentative, "Hello." "Hi," was the answer in nearly flawless English, "Where are you from?" I told her, "Colorado in the U.S." She said, "Oh, I graduated from Denver University in Colorado." Small world. She said she had just received a call to check the installation of her new exhibition which opened in two days and invited me to come take a peek. 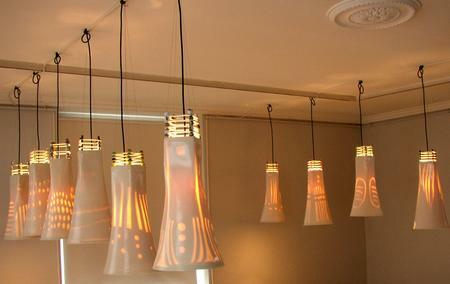 What I saw were many vanilla-colored free-form ceramic tubes hanging from the ceiling, interesting but not spectacular--until they turned them on. The scene and the shadows were truly exceptional. 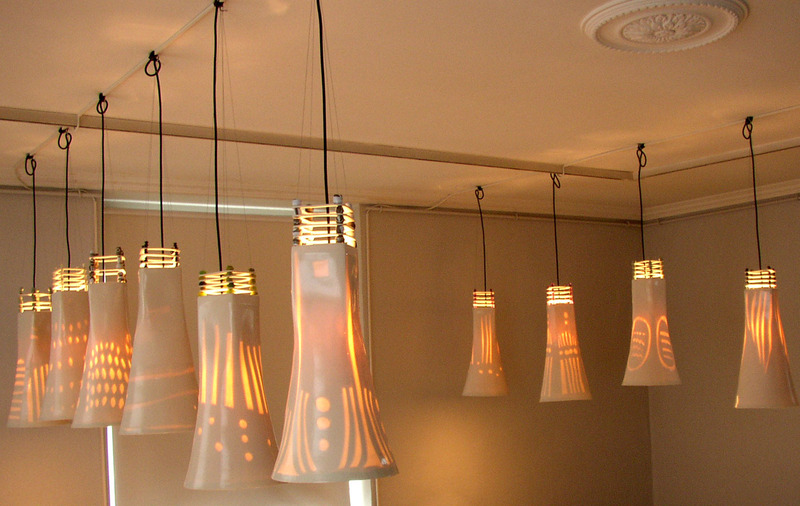 I cherish the gift of light a Porvoo artist gave me that day. I love coffee table books, those books containing mostly photos of captured moments. One I recently acquired is One Planet, compiled by the publishers of Lonely Planet Guides. Another one I bought two copies of at after-Christmas sales is America 24/7 and plan to give them to our hosts when we visit Chile later this year. A friend told me that my blog is becoming a collection of captured moments. Exactly! When one collects people as we do, the memories are captured as special moments of shared communication. Sometimes it is through art, through a shared story or gift or just a moment sharing wine from some relative's small grape arbor outside a small, virtually unknown town in Italy or Chile or Peru or Estonia. Maybe I'm making my own annotated Coffee Table book--online. I am approaching another birthday and dealing with some routine aches of aging. I remember hearing someone say he/she loved collecting antiques because it put them in close association with older things that had aged beautifully and with character. We have some pieces of furniture from Bob's great-grandparents, given to them for their wedding in the late 19th century. I feel younger and humbled in their presence. Yesterday I was once again trying to see just what my digital camera was capable of and tried the ultra-close or "Flower" mode to try and capture the interior of a small (1" tall by 1/2" in thick) piece of Baltic Amber that we brought back from Estonia last summer. With a little help from our desktop Ott light, I managed to capture its inner history. 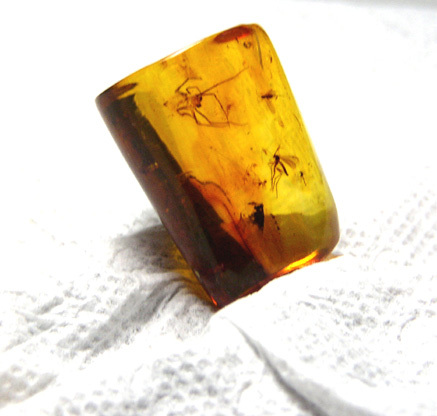 Experts estimate the age of amber, from that particular region, at around 40 million years. Inside this one are five insects that we can recognize: a spider, a mosquito and three smaller or partial "winged" things plus a couple of indistinguishable blobs--possibly decayed matter. This small piece the size of my thumb carries within it unbelievable stories. Yes, I feel younger--and a bit insignificant in the greater scheme of things. 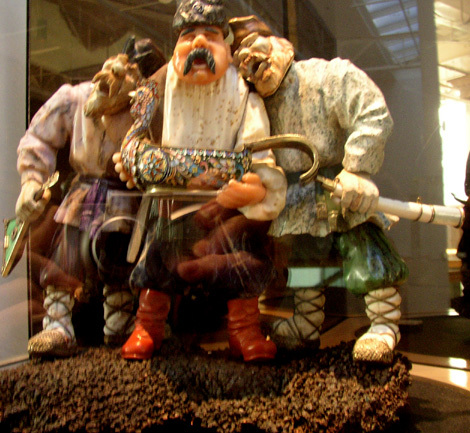 One of my favorite permanent exhibitions at the DMNS is the collection of gem carvings by Vasily Konovalenko. We are fortunate to have approximately 30 pieces here in Denver. Each scene is carved from selected gemstones to represent various colors and textures. The photo above was taken through thick glass and had three-way mirrors to reflect side and rear views, so the quality of the photo does not do the scene justice. The Collection can be seen on the web in more detail. 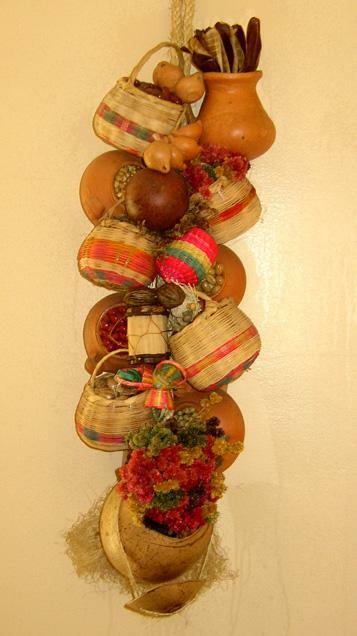 This Trenza de Abundancia (braid of abundance) hangs on my breakfast nook wall. Recently I was asked what it means. I'm not really sure. I only know what I was told when Eloisa gave it to me in Bogota--that it was a Colombian symbol of abundance/fertility. I assume it has much the same symbolism as does the Cornucopia. I began a search for abundance symbols online and it seems most cultures have one--or more. The Chinese character/word for fish is the homonym for abundance. The Maori tribes of New Zealand historically wore fish hooks carved from bone to represent abundance/prosperity. Some Native American tribes consider the squash blossom a symbol of fertility or abundance. Even our own Easter Bunny got his start as a symbol of fertility. 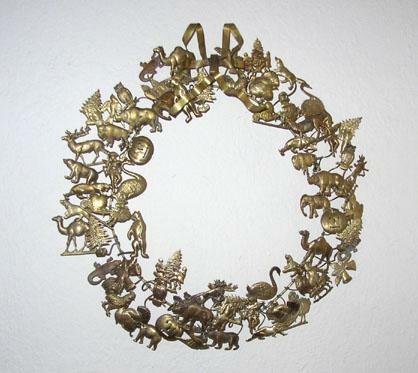 It is ironic that so many of the historic symbols represent both fertility and abundance. Perhaps someone reading this will know of more symbols or have more information about the prevalence of such symbols in so many cultural histories. I find myself with a couple of free days so I thought I'd put away some Christmas gifts and rearrange some decorative gifts given to us in the past. We often shake our heads and wonder out loud, "What ever became of the young couple who was determined not to let "things" overwhelm their lives?" " Yes, but back then we were talking about impulsively-purchased, materialistic, acquisitive, values-corrupting THINGS, not sentimental love-gifted things with names, faces and stories attached." The carved-horn "decorative" gift in the picture was given to us by Jon and Dominic, the Ku brothers who owned the Bamboo Garden restaurant. We met them through Denver International Program when I took our D.I.P participant--from Hong Kong-- with me to ask if they could donate two dinner gift certificates to our silent auction fundraiser. Not only did they contribute but they came to the fundraiser and bid on--and bought--several items. Afterward we became regular customers of their restaurant and good friends. Nine years later we invited them to our "Come Dance With Us" party for our 25th Wedding Anniversary and they came bearing this gift--the most unusual one we've ever received. When asked if it had any symbolic meaning attached, they simply answered: "No." I am sometimes at a loss for where to put it, but I would never part with it because it has a story--with names and faces attached. This little guy--or gal--can always make me smile. Today following being stood up a second time, after waiting three hours each time for a technician from Ultimate Appliance Repair to check out my non-functioning oven, I was so angry that I grabbed my coat and camera and went walking through the zoo. It's always interesting to see which animals are outside and active on very cold days. It is not always the ones I would guess. The polar bears and Arctic wolves were all lying still. The Grevy's zebras--whose home habitat is the plains of Africa--were out of their barn and moving around. The African wild dogs were tearing around and around in circles, jumping over logs and pouncing off the roof of a small dog house in their running area. The red pandas, usually very shy, were both out near the viewing wall and posing for photos. Only recently did DNA samples shed some light on the question of whether the Giant Panda and the Red Panda were related and whether either or both was a member of the raccoon family. The results of the tests indicated that the Panda is indeed a member of the bear family and the red panda is not a panda at all but a member of the raccoon family. After two hours of zoo-viewing and errands I returned home and made an appointment with the Sears Appliance Repair Department. I should have called them first as I've used them before and had satisfactory results--but the other guys had a coupon for a free service call and a senior's discount. That little voice in my head--probably my mother's--is saying, "If it seems too good to be true, it almost certainly is!" 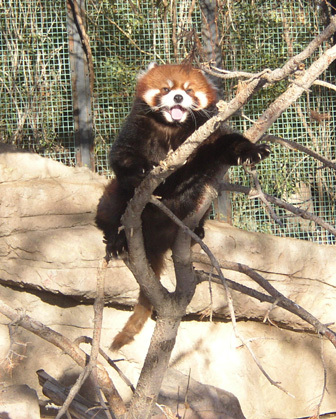 Now I feel much better and I credit the smile of the red panda. 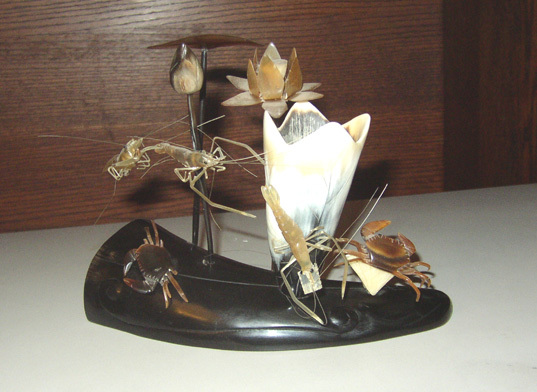 Some years ago I went into a shell shop in San Diego and found this carrier shell. I had never heard of them before. 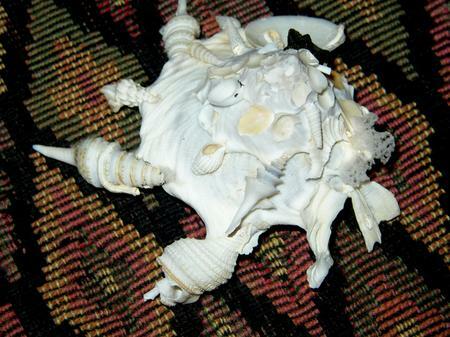 Immediately this shell became a metaphor of sorts for me. In this shell I see all the people and places that have touched my life. A part of each stays with me and I am forever changed. They decorate my life. Since that time I always look for carrier shells. I once found one that had lived near a volcanic black sand beach and its decorations were all pieces of lava and dark-colored debris from its environment. The tragedy is that many carrier shells die and end up in shell shops because they attached to themselves ornamentation too heavy to carry. 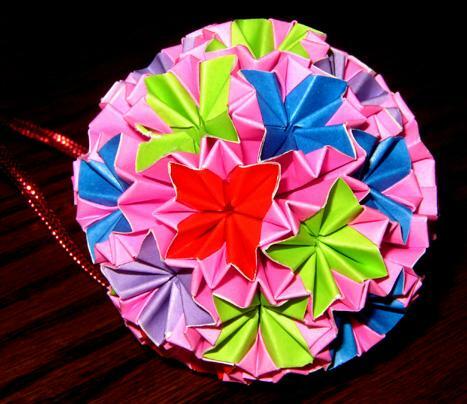 Recently a friend from an online list provided a link to a wonderful collection of papercraft--including small motorcycles: http://www.yamahamotor.co.jp/eng/papercraft/ (I couldn't get the link to insert properly so you'll need to cut and paste---Sorry) Viewing this link reminded me to get out my origami Christmas ornament. I had forgotten it since I keep it in a special case rather than in the box with the other ornaments. Satoru Kitagawa, a long time guest and practically a member of the family, gave this ornament to me for the Christmas season of 1995. A Japanese secretary at the language school he attended made it for me at his request. It is one of my Christmas treasures. Lately I've become obsessed with capturing on camera the beauties of all four seasons. Yesterday Bob and I went to the Denver Botanic Gardens. We were the only people in the gardens except the caretakers. It was magical. Grasses, thistles, pods and shrubs--still bearing their autumn golds and browns--waved in the brisk wind. Afterwards we went inside for a cup of coffee before visiting the Cloud Forest room--full of orchids and epiphytes--in the tropical atrium. I love living urban. We can reach museums, gardens, baseball, theater and symphony and zoo all within 10 minutes. See Link for excerpt from a 1965 magazine. (2) A Child's Christmas in Wales by Dylan Thomas: a fantastic celebration of holiday memories. My husband has become a shipbuilder. After 38 years of flying airplanes Bob is now pursuing all things nautical. 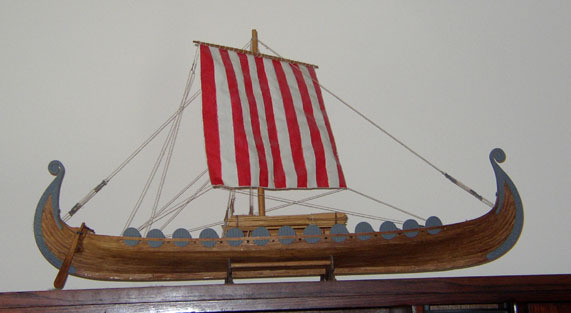 He buys a box full of wood and miniscule parts along with pages of instructions and 300 to 400 hours later, Wa-la, a replica of an actual ship. The Viking ship (replica shown above) with a beautifully carved keel was discovered in Norway in 1903 and was probably built around 800 A.D. Known as the Oseberg, this ship was approximately 71 feet long and 16 feet wide with 15 pairs of oars and a nailed-down deck. It was not well suited to the open ocean due to the nature of its construction and was more than likely used as a pleasure ship. This one was ultimately used as a burial ship and the blue clay in which it was buried helped preserve it, and some of the ornaments and possessions which belonged to the person buried in it (The person is thought to have been a female, possibly royalty). Since retirement Bob has built seven larger ships, among them the Canadian Blue Nose II and the British HMS Winston Churchill and several smaller canoes or barges. He is now working on the Cutty Sark, a British ship that is permanently anchored in Greenwich England. I love the dramatic tallships with sails unfurled but the Oseberg with its one sail and dramatic curved bow and stern really speaks to me. Because a great many of my "connections" are captured on camera, I decided to add a new category to my blog: Favorites. I envision sharing photos of my favorite beach, my favorite castle, etc. Today's favorite just happens to be my favorite photo of an insect. It may actuallyl be my only photo of an insect as I don't make a habit of photographing invertebrates. 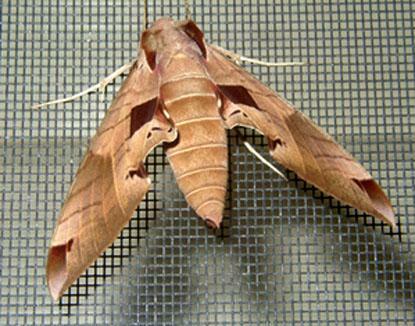 One day I just happened to catch this moth sleeping the day away on my screen door so I took its picture. It stayed there all day but as soon as night fell it was off to do whatever nocturnal insects do--probably hide from daytime predators. If any one out there can give me this moth's proper name, I'd appreciate it. I checked on the Internet but the closest I could get was "leaf moth" and I'd really like a more scientific identification. Bob and I went to the Colorado Art Expo today for a couple of hours. It was a huge exhibition and almost all the artists were tending their own booths. Some who work in ink, pencil or watercolor were actually creating on site. Colorado has some extremely talented artists. I almost resisted temptation: I only bought a gemstone pendant of South American Pietercite which is a combination of tiger's eye and jasper. The artist set the stone in a woven wire rope of sterling silver and gold-filled sterling. It is a delightful combination of gold, red, light olive green, deep blue and brown. Afterwards we walked to the Tivoli Starz indie movie theaters to see The Singing Detective with Robert Downey Jr. I loved it. He played the part of an emotionally (and physically) scarred, very talented person as if he'd been there and done that--which of course he has.